The information gleaned from routine oil analysis can help optimize lubricant life, ensuring viable lubricants are not prematurely put to waste. 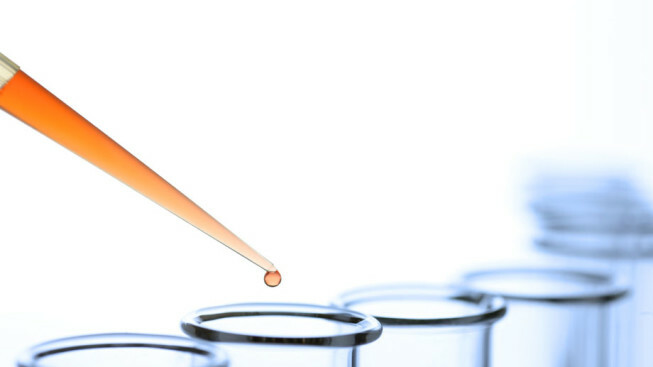 The laboratory reports on oil samples typically contain a great deal of test data along with comments and recommendations. Although the statements should be clear and comprehensible, they may not tell the complete story. This introduction to some common oil analysis tests will help you understand your reports more easily and thoroughly. Background: Arguably the most important property of a lubricant, viscosity measures the oil’s resistance to flow. Viscosity changes inversely with temperature, making both operational and environmental temperatures of an application vital factors in lubricant selection. After all, the lubricant needs a low enough viscosity to ensure timely flow to lubrication points, and it needs a high enough viscosity to maintain an adequate film layer between moving parts, keeping them separated despite the applications speeds, loads and pressures. If a lubricant’s viscosity is too high or too low, problems such as excessive friction, wear and heat typically occur, potentially leading to equipment damage or failure. Beyond temperature fluctuations, if the viscosity of a lubricant in use increases, this typically indicates oxidation and/or thermal degradation. A decrease in viscosity could be due to a number of reasons, such as shearing (the severing of oil molecules into smaller molecules) or contamination of the lubricant by a substance with a lower viscosity. Testing: Most oil analysis tests conform to American Society for Testing and Materials (ASTM) standards. 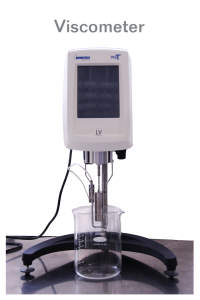 For viscosity, the commonly used test ASTM D445 measures the time it takes for the lubricant, contained in a glass viscometer and maintained at a closely controlled temperature (typically 40°C), to flow between specific points in a calibrated capillary tube by force of gravity. The result is usually reported in centistokes (cSt). 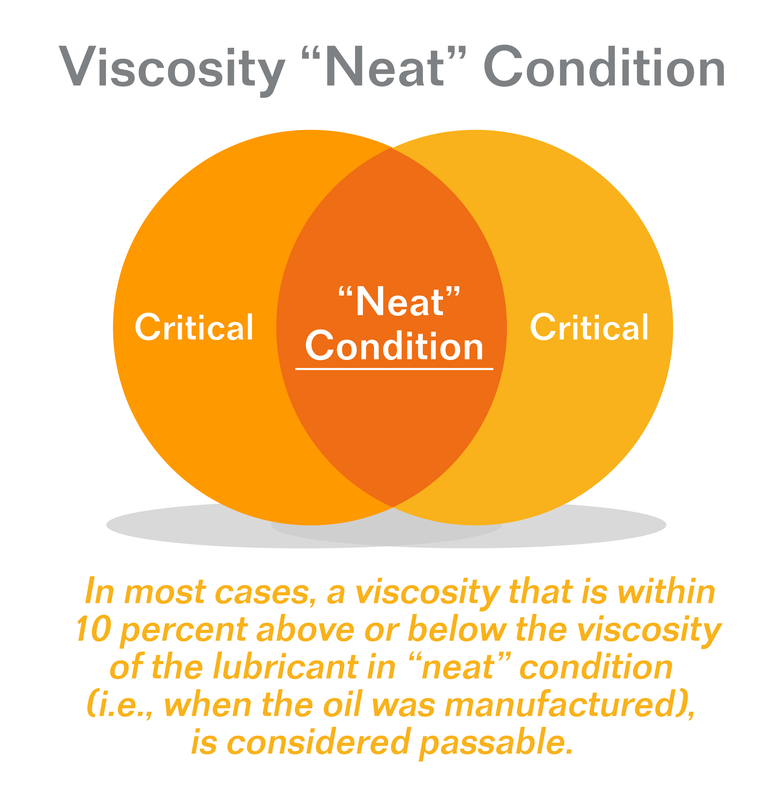 Results: In most cases, a viscosity that is within 10 percent above or below the viscosity of the lubricant in “neat” condition (i.e., when the oil was manufactured), is considered passable. 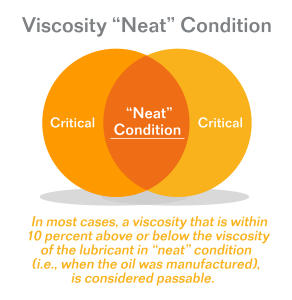 A difference in viscosity of at least 10 percent above or below the neat viscosity is generally considered critical, meaning the oil should be monitored closely or changed. In either situation, additional types of tests may be called for to identify the cause of viscosity change, so that it may be corrected. Background: Oxidation, the process of a lubricant’s degradation over time due to its chemical reaction with oxygen, diminishes a lubricant’s service life. It typically causes the lubricant’s viscosity to increase, and it produces harmful byproducts such as acids and sludge. These changes can impede lubricant function and adversely affect equipment operation. The more rapidly oxidation progresses, the shorter the oil’s life span. Excessive heat, air and water exposure are some of the catalysts that can hasten the process. Testing: Because oxidation produces acidic content in a lubricant, oxidation of a lubricant can be assessed by testing the oil’s total acid number (TAN) with a test such as ASTM D664 or ASTM D974. With either of these tests (distinguished by the measuring device used), potassium hydroxide (a base solution) is added to 1 gram of lubricant until the oil’s acidic content is neutralized. The TAN is that amount of potassium hydroxide, in milligrams. A high acid level requires more potassium hydroxide for neutralization, translating into a higher TAN. Results: Most lubricants in their neat form have a TAN of less than 0.1. If the TAN of such a fluid reaches a level of approximately 0.5 to 0.8, it should be monitored closely. Some lubricants have relatively high initial (neat) TAN levels; for those, any significant increase should be watched. A lubricant generally should be changed if reaches what is considered its condemning limit. For most lubricants, the condemning TAN limit is 1.0. 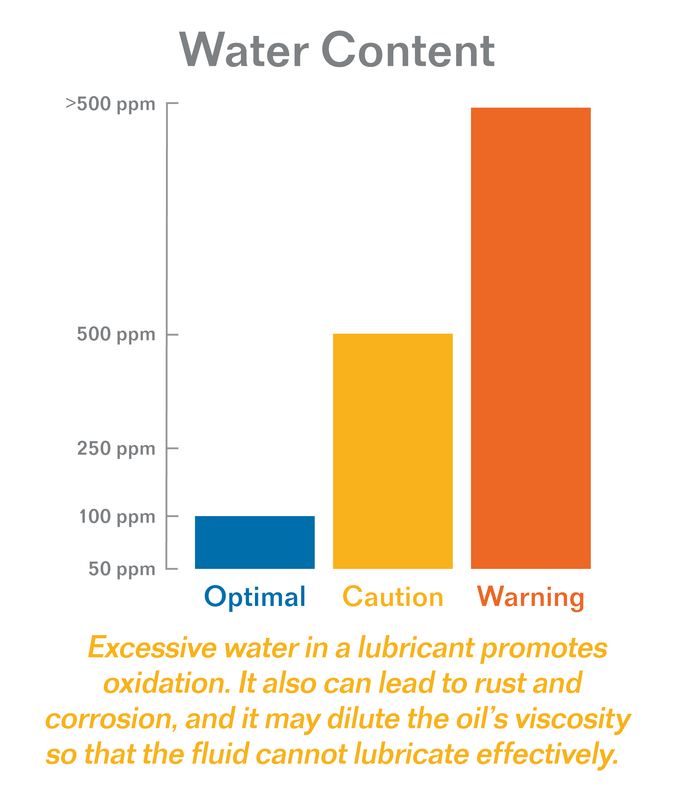 Background: Excessive water in a lubricant promotes oxidation (discussed above). It also can lead to rust and corrosion, and it may dilute the oil’s viscosity so that the fluid cannot lubricate effectively. The amount of water considered “excessive” in a lubricant depends on the lubricant itself — some formulations are more resistant to the adverse effects of water than others. Testing: The Karl Fischer Water Test (ASTM D6304), named for the chemist who invented it, can accurately measure water content as low as 10 parts per million (ppm) or 0.001 percent. With this procedure, a chemical reagent that reacts to water is gradually added to the oil in carefully measured amounts until the reagent-water reaction stops. The amount of reagent used is directly proportional to the amount of water in the oil. Results: The water content of neat lubricants can vary greatly from one formulation to another. For many, it is below 50 ppm (0.005 percent) while for some it is closer to 100 ppm (0.01 percent). In many cases, the range of approximately 250 to 500 ppm (0.025 to 0.05 percent) is considered the caution level, and water in excess of 500 ppm (0.05 percent) might be considered serious enough to merit an oil change. Background: Metals in a lubricant can be the undesired result of component wear, or they could be there intentionally as part of the additive composition in the formulation. Evaluation of the types of metals in a lubricant and their quantities can help assess additive performance as well as wear activity. Abnormalities may point to the need for an oil change. Testing: One often-used test is elemental analysis by inductively coupled plasma (ICP) spectrometry (ASTM D5185). With this procedure, the oil is mixed with an inert gas, forming an aerosol mist that is then exposed to intense heat. The heat causes metal ions (charged particles, also referred to as plasma) in the mist to take on and release energy. The spectrometer detects and measures the energy relative to each type of metal, determining its concentration in the lubricant. 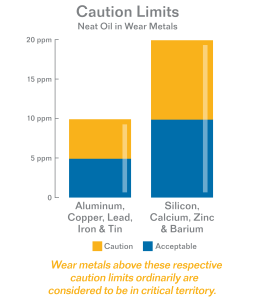 Results: Regarding wear metals, they generally are absent from neat oils. Some such as aluminum, copper, iron, lead and tin generally should be watched closely if they reach levels of 10 to 20 ppm. Others such as chromium, nickel, silver and titanium typically should be watched upon attaining the 5- to 10-ppm range. Wear metals above these respective caution limits ordinarily are considered to be in critical territory. The “acceptable,” “caution” and “critical” levels for most other metals vary depending upon the specific lubricant. For example, a certain amount of zinc might be expected in a lubricant if the manufacturer uses a zinc-based additive in the formulation. But more zinc than the anticipated level, or any zinc in a lubricant with no such additive, might indicate wear of galvanized components. It is critical to consider the metal content of the neat fluid as well as the lubricant’s tolerance for each metal in question before drawing conclusions. The lubricant manufacturer or supplier should be able to provide this information. Isel offers oil analysis and reporting on all Isel-manufactured lubricants. With our fully equipped in-house laboratory, our knowledgeable engineers and technical support team are available to help interpret test results as well as provide product support and recommendations. You can rely on our expertise and experience to help you get the most out of your Isel lubricants and the equipment they serve. For more information about Isel’s oil analysis program, please contact us.